Location ( From The Green Zhurga ): 3.4 Km, about 6 minutes drive. This restaurant was recommended by some friends and I had also noticed that it’s also recommended by several travel guide books. Stepped into the compound of Made’s Warung and found that it housed a number of specialty shops from handicrafts to chocolates. At first I was wondering where the restaurant was, as there were tables and chairs placed outside the shops with no sign of the restaurant or the service staff. It wasn’t until we walked further in then we saw the bar and restaurant counter. There were many Japanese students and their parents and teachers and it looked like they were preparing for a performance of sorts. Wasn’t particularly hungry after a heavy breakfast earlier so I didn’t order much to try here. Ordered the gado-gado and the spicey pork sate and they were really good!! 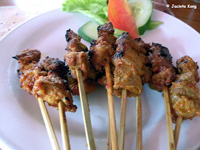 The sate didn’t come with any sauce but it was well-marinated and the pork was very tender. Nice!! 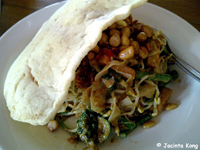 In addition, the gado-gado tasted better than the versions we’ve had in Singapore! Washed it down with some honey melon juice – my 3rd choice after finding out that both mango and strawberry juices weren’t available that day. Ohh…the ice lemon tea was good too! Will definitely go back to try other dishes if I go back to Bali again!